Kate Di Prima - Dietitian: Fresh herbs........pure perfume! I simply love what I do. Not just because I help people feel and look better, and possible extend some lifespans; sometimes I receive little thank you gifts especially around holiday time. Now I am not saying that I am motivated by presents but I have been on the receiving end of some delightful gifts. I absolutely love the home made things. One lady brought me some fresh quince jam and another some cranberry sauce for the turkey this Christmas. On Wednesday last week a patient and her mother brought me a full bag of home grown herbs and vegetables which just blew me away - the smell was simply intoxicating (I had literally forgotten what a backyard fully mulched cherry tomato smelt and tasted like - my family used to grow them when I was a child). In my bag -o -goodies was basil, coriander, lemongrass, marjoram, parsley and mint - just to name a few. So today I am throwing together some pesto and tonight's dinner we are having Vietnamese cold rolls (the mint just smelt so good!!!). 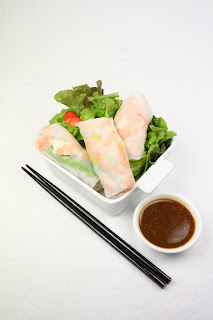 See my super easy recipe below - you can wrap just about anything in rice paper rolls. That sounds like a delicious dinner, just reading the recipe is making me hungry... and I have already eaten! I have got parsley, sage, rosmary and chives in my herb garden at the moment which are smelling gorgeous in the summer sun these days!